Australia’s climate policy environment is a changing landscape, at local, state and federal levels. From coast to coast there are a range of different frameworks, structures and mechanisms that are in place to constrain or drive down emissions in the transition to a zero-carbon economy. Below, we have painted a picture of this landscape, covering what Australian governments are doing at the Commonwealth and State levels, but also how these policy suites interact on the global stage. Understanding this suite of policies can help Australian business better understand the risks and opportunities that we face in the transition to a zero-carbon economy. For Australia to meet its 2030 Paris Agreement target of 26% – 28% emissions reduction below 2005 levels, our existing suite will need to evolve to drive emissions below business as usual. As a key, constructive and independent markets voice in the policy discussion, CMI continues to put forward various ways that domestic policy could evolve to meet our targets, and create economic opportunities at home and abroad. 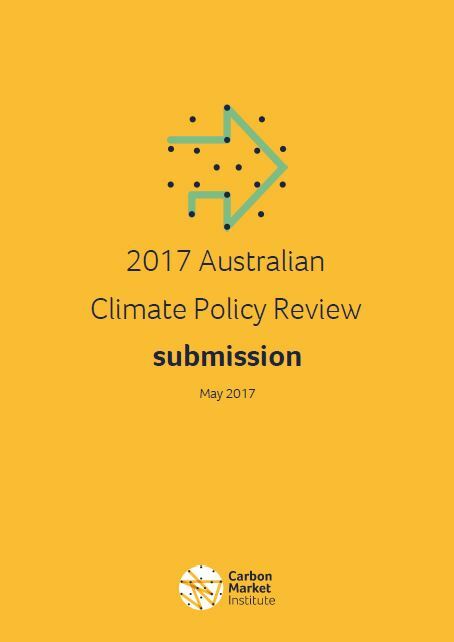 These policy positions are noted throughout this page, beginning with our submission to the 2017 Climate Policy Review, below. The Australian Government’s climate change response consists of a suite of complementary policies designed to drive emissions reduction in line with Australia’s domestic targets, and international obligations under the Paris Agreement. This suite of policies covers a broad range of frameworks including those relating to carbon farming, industrial emissions reductions, renewable energy supply, electricity generation, as well as a national focus on investment and economic regulation. These policies have emerged as an enduring framework under former Environment Minister, Hon Greg Hunt MP; the current Turnbull Government, has merged Environment & Energy into one portfolio allowing for potentially closer linkages of climate change and energy policies over time. Environment & Energy Minister Hon Josh Frydenberg MP oversees the delivery of the below suite of climate change policies; this also includes oversight and direction of the following four statutory and regulatory bodies: Australian Renewable Energy Agency, Clean Energy Finance Corporation, Clean Energy Regulator and the Climate Change Authority. 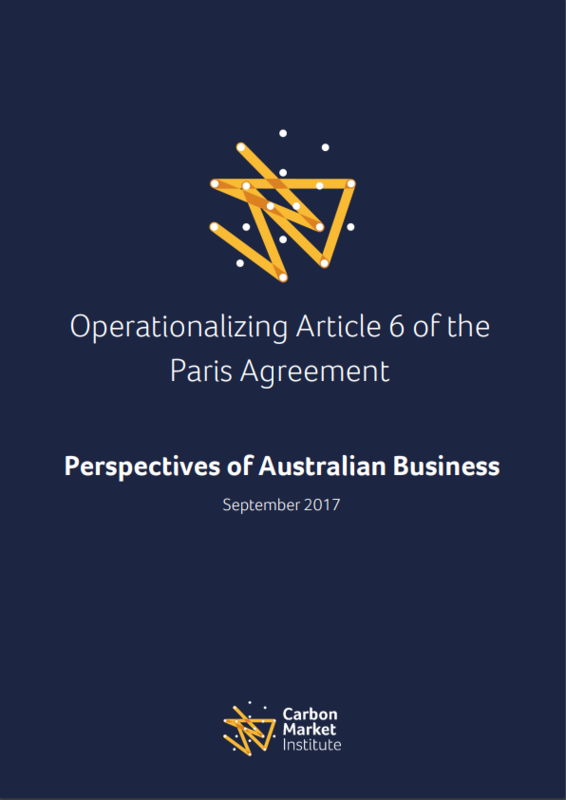 Below are outlined some of the key policies that form the Australian Government’s Direct Action Plan, as well as other issues and considerations that take into account the position of industry on how existing policies should evolve to enable emissions reduction across the economy, and creation of economic value through linkage with international markets. The Emissions Reduction Fund (ERF) is the centrepiece of the Government’s Direct Action policy on climate change, providing incentives for emissions reduction activities in the form of a $2.55 billion fund which purchases domestic abatement from across the Australian economy. Emission reductions project funding is designated to a wide range of abatement projects through a reverse auction process, and through the generation of Australian Carbon Credit Units (ACCUs) for abatement delivered. Eligible projects, including storage of carbon in forests and soils, improving energy efficiency, fuel switching, and methane capture from landfill (amongst others), must meet an approved methodology and be registered with the Clean Energy Regulator – the federal statutory authority charged with oversight and regulation of Australia’s clean energy industry. To date, seven auctions have been held, the latest having taken place in early June 2018. The Regulator has spent $2.3 billion across these first seven auctions, which has resulted in 461 contracted projects representing 192 million tonnes of abatement at a weighted average price of AUD$11.97 per tonne of abatement. 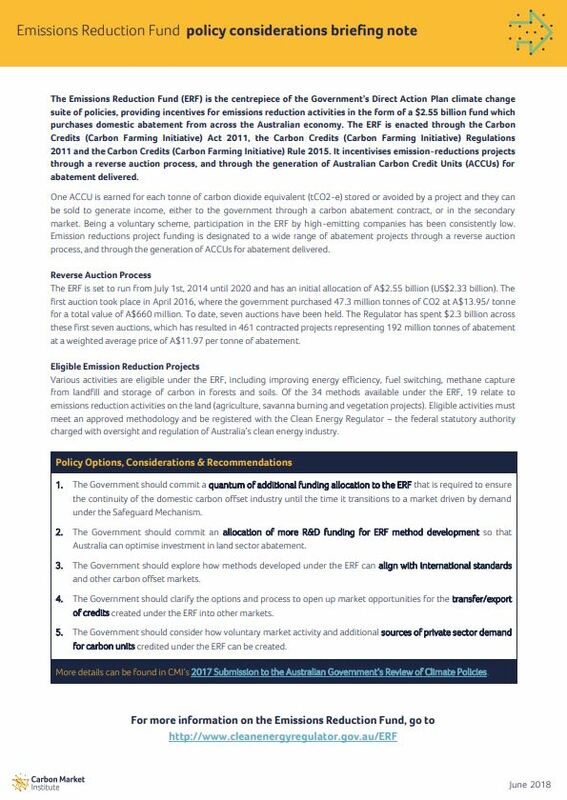 Allow businesses that exceed their baselines to surrender Australian Carbon Credit Units (ACCU’s) to the Government to offset their excess emissions. The government is currently undertaking a legislated review of the ERF and Safeguard Mechanism as part of its review of climate change policies. The review must consider, among other things, the context and criteria under which baselines might be adjusted, particularly around alignment with anticipated increase of ambition under the Paris Agreement and Australia’s longer-term international 2030 targets. 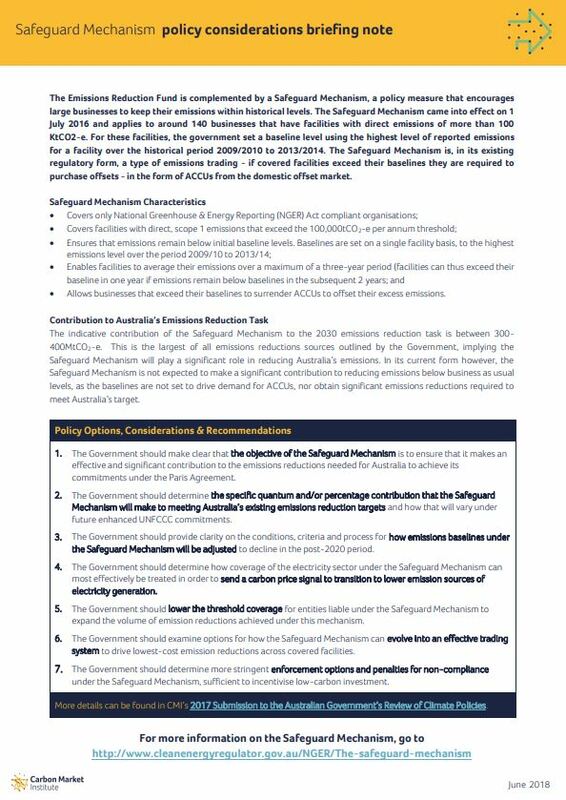 The first reporting period of the Safeguard Mechanism ended on 30 June 2017 with emissions reported to the Clean Energy Regulator as part of the NGER scheme on 31 October 2017. In this first year, sixteen facilities exceeded their emissions limits, resulting in the collective surrender of 448,097 ACCUs to meet compliance obligations. The National Energy Guarantee (NEG) is not currently a policy mechanism within the Australian Government’s existing suite of policies; rather it is a proposed primary energy policy for Australia, addressing the need to provide reliable, secure and affordable electricity within the National Electricity Market (NEM). Although this policy has been the subject of intense scrutiny by the Government, no formal decision has been made about it’s future implementation. 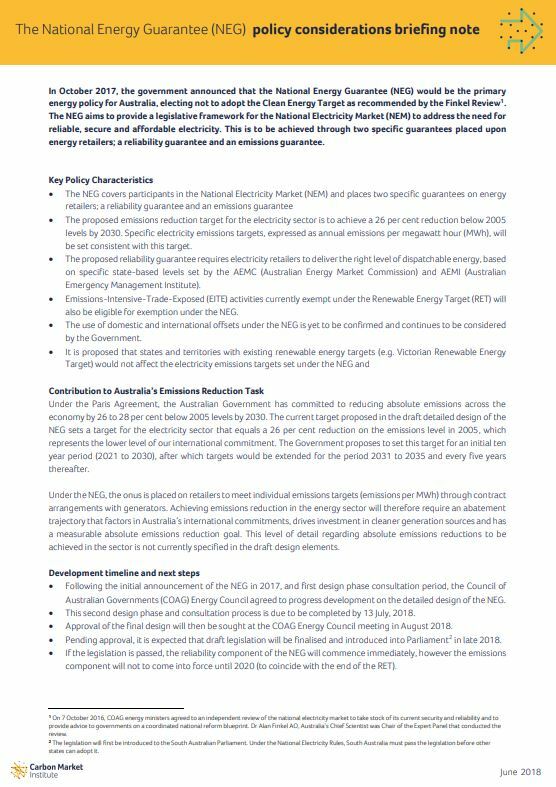 The proposed NEG covers participants in the National Electricity Market (NEM) and places two specific guarantees on energy retailers; a reliability guarantee and an emissions guarantee. The proposed emissions reduction target for the electricity sector is to achieve a 26 per cent reduction below 2005 levels by 2030. The proposed reliability guarantee requires electricity retailers to deliver the right level of dispatchable energy, based on specific state-based levels that would be set under the NEG. The emissions component proposed in the draft detailed design of the NEG set a target for the electricity sector that equals a 26 per cent reduction on the emissions level in 2005, which represents the lower level of our international commitment. The Government proposed to set this target for an initial ten year period (2021 to 2030), after which targets would be extended for the period 2031 to 2035 and every five years thereafter. However, in recent months, doubt was cast over the efficacy of the emissions component, and as such the future of the implementation of this component as part of the proposed NEG is uncertain. Pending approval of the final design of the NEG at the COAG Energy Council meeting in August 2018, it is expected that draft legislation will be finalised and introduced into Parliament in late 2018. If legislation is passed, the reliability component of the NEG will commence immediately, however the emissions component will not to come into force until 2020 (to coincide with the end of the RET). Purchasing international units could help to achieve our national emission reduction commitments at lower cost, as cheaper abatement opportunities may exist overseas. This is because reducing one tonne of emissions in one jurisdiction has the same environmental value as reducing one tonne of emissions anywhere else. It has been estimated by the World Bank that international cooperation through carbon markets can reduce the global costs of NDC implementation by 30% by 2030 and by 50% by 2050.
International markets offer an effective ‘hedge’ against the risk that current national and/or sub-national policies do not deliver the emissions reductions needed to meet Australia’s international commitments. There is potential to open up new markets and new business lines for Australian businesses, as the transfer of international units could occur in both directions and corresponds to a transfer of finance and investments. 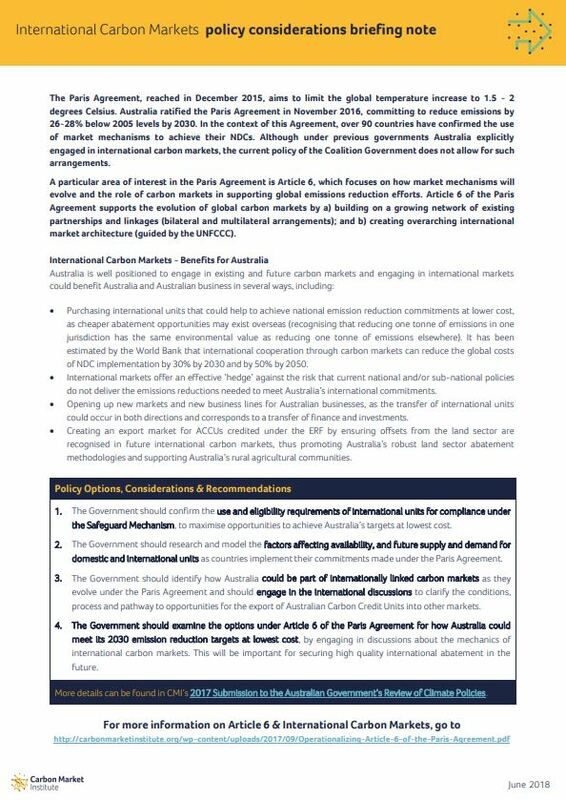 There are various other ways that participation in international markets could assist Australia’s capacity to engage in climate change action in our region, details of which are outlined in the below International Market Considerations Briefing Note. The Renewable Energy Target (RET) is a national climate policy aimed at reducing Australia’s electricity sector emissions whilst simultaneously encouraging renewable energy source development and diversifying Australia’s national energy mix. The RET has two main schemes: Large-scale Renewable Energy Target (encouraging investment in renewable power generation) and the Small-scale Renewable Energy Scheme (supporting small-scale installations such as household solar or solar water heaters, heat pumps), both administered by the Clean Energy Regulator. It operates through the creation of tradeable certificates which incentivise energy generation from renewable sources. A 100% exemption from RET liability is accorded to electricity used in undertaking emissions-intensive-trade-exposed activities (EITE). The RET was introduced in 2001 with an initial target of 9,500 gigawatt-hours of Australia’s electricity to be generated from renewable sources. This target was reviewed in 2009, increasing the expected renewable share of Australia’s national energy mix to 20% of total supply by 2020. The RET was reviewed in 2014 by the Climate Change Authority, who recommended that the RET maintain its trajectory towards a 41,000GWh target by 2020. Following parliamentary review in June 2015, the RET was reduced to 23.5% or 33,000GWh of electricity generated by renewable sources by 2020. The redefined RET policy also removed legislation requiring review of the target every two years and made amendments regarding EITE activities. Approximately 17,500 gigawatt-hours (GWh) of renewable energy were generated in 2016 towards meeting the large-scale component of the Renewable Energy Target (RET), placing the industry just over halfway towards achieving its target. Record investment in 2017 has boosted the nation’s large-scale generation capacity making it the biggest year ever for renewable energy new builds, 46% of the new capacity being solar. Under current policy the RET will end in 2020 and not be extended. It is recommended by the Energy Security Board (ESB) that a National Energy Guarantee (NEG) replace the RET post 2020 with designs for a reliability guarantee and emissions guarantee whereby emissions profiles would be required to comply with nationwide emissions targets. The National Electricity Market (NEM) commenced operation as wholesale spot market for electricity in December 1998. It connects five regional market jurisdictions – Queensland, New South Wales (including the Australian Capital Territory), Victoria, South Australia, and Tasmania and is administered by the Australian Energy Market Operator (AEMO) and enforced by the Australian Energy Regulator. Western Australia and the Northern Territory are not connected to the NEM, primarily due to distance between networks. The NEM operates on one of the world’s longest interconnected power systems with a distance of around 5,000 kilometres (40,000 circuit kilometres) and with a total generating capacity of almost 52,500 MW, it supplies approximately nine million metered customers. Assets are owned and operated both by private operators and state governments, and the 200 registered participants are comprised of electricity generators, transmission and distribution network service providers, and market customers (retailers). The future of the electricity market will significantly impact how Australia achieves its emissions reductions targets, since coal fuels nearly 65% of electricity generation – well above the global average of coal fired generation of 41%. With the integration of new and emerging generation (renewables), storage and demand management technologies, the NEM is being transformed and issues of supply and reliability are emerging. Changes from a grid previously dominated by large-scale, fossil fuel-fired synchronous generators into a grid with a mix of supply technologies are placing increasing pressure on the NEM. In an effort to take stock of the national electricity market and plan for its future, an independent review to the Council of Australian Governments (COAG) Energy Ministers was undertaken by Australia’s Chief Scientist, Dr Alan Finkel, and with the final Blueprint for the Future report presented in June 2017. Australian state and territory governments have made many policy responses to climate change. Nearly all States and Territories now have strong renewable energy targets and/or aspirational zero emissions targets in place. The Environment, Planning and Sustainable Development Directorate has a strong commitment to climate change and is responsible for meeting the challenges of climate change on behalf of the ACT by developing and implementing nation-leading policies. Reduction targets are established under the Climate Change and Greenhouse Gas Reduction Act 2010. The ACT’s strategy is guided by the 2nd Action Plan, AP2 which sets out a summary of actions. The ACT Government also released a Climate Change Adaptation Strategy in July 2016. 40% reduction in greenhouse gas emissions on 1990 levels by 2020. 100% renewable energy by 2020 and substantial job creation. Canberra will be carbon neutral by 2050. The NSW Government emissions reduction is overseen by AdaptNSW, the state’s climate change agency that sits within the NSW Office of Environment & Heritage. A NSW Climate Change Policy Framework was released in August 2016 outlining objectives and guiding policy. Between 2017 and 2022, NSW will invest $1.4 billion through a Climate Change Fund Strategic Plan to meet these objectives. Achieving net-zero emissions by 2050 and helping NSW to become more resilient to a changing climate. 20% renewable energy by 2020. 16,000 GWh annual energy reduction by 2020. Support to reduce energy use by 20% in 220,000 low-income households. Targets to increase walking,cycling and public transport usage. Planning policy to reduce vehicular emissions through decentralised job growth. The Northern Territory Climate Change Policy, a ten-year plan released in December 2009, ensures the Territory plays a role in national and international efforts to mitigate and adapt to climate change, overseen by the Department of Lands, Planning and the Environment. Reduce greenhouse gas emissions by 60% by 2050, below 2007 levels. 20% of power to be generated from renewable sources by 2020. $34 million investment in climate change mitigation and adaptation strategies. Replace diesel as the primary power source in remote towns and communities by 2020. Establish a carbon offset industry by 2020 and reduce emissions from savanna burning by 500,000 tonnes per year in 2030. An related action item is to develop a policy framework for carbon property rights in the Territory. Grow the green economy: 10,000 Territorians with green skills training by 2020. The Department of Environment, Water, and Natural Resources (DEWNR) is responsible for state-wide policy, the administration of legislation and the delivery of programs regarding helping South Australia prepare for climate change. Reduction targets are established under the Climate Change and Greenhouse Emissions Reduction Act 2007 and a new climate change strategy “South Australia’s Climate Change Strategy 2015-2050 – Towards a low carbon economy”, released in November 2015, sets the framework for significant emissions reductions. Achieve zero net emissions by 2050. Make the City of Adelaide the world’s first carbon neutral city. Ensure Statewide resilience with regional climate change adaptation plans under the adaptation framework. Achieve $10 billion in low carbon investment by 2025. Generate 50% of electricity from renewable sources by 2025. Improve the energy efficiency of government buildings by 30 per cent of 2001 levels by 2020. Signatory to the Global Climate Leadership Memorandum of Understanding (Under2MOU). Advocating for a national emissions trading scheme. A long-term aspirational goal to achieve zero net emissions by 2050 with a proposal to legislate this target under the Climate Change (State Action) Act 2008. Advance renewable energy capability – increasing hydro-electricity generation by 10% and possibly become a net exporter improving reliability across the NEM. Reduce transport sector emissions – EV Demonstration Project and rollout of EV charging network whilst supporting public transport uptake. Through the Department of Environment and Heritage Protection, the Queensland Government is committed to managing the impacts of climate change in a responsible and cost-effective manner, with a particular responsibility for the conservation and protection of the Great Barrier Reef. Reach zero net emissions by 2050 with an interim target of a minimum 30% reduction on 2005 levels by 2030 as seen in their Climate Transition Strategy. Generate 50% of energy from renewable sources by 2030. A $500 million Land Restoration Fund aiming to expand carbon farming by supporting land-sector projects. A CarbonPlus Fund of $8.4 million to support and expand the carbon farming industry. The Advance Queensland initiative (Biofutures 10-year Roadmap and commitment to an Electric Vehicle strategy). A $3 million Climate Adaptation Strategy. $12 million over 3 years to help coastal communities plan and prepare for climate change impacts. One million solar rooftops by 2020.Support investment through government issued Green Bonds. A Queensland Climate Adaptation Strategy framework. The Department of Environment, Land, Water and Planning (DELWP) leads Victoria’s response to climate change,working with business and the community to develop effective adaptation and mitigation strategies, under the new legislation, the Climate Change Act 2017 that commences on 1st November 2017. This world-leading legislation is aimed at driving action on climate change and has enshrined renewable energy targets in law, establishing a reverse auction mechanism to build 650 megawatts worth of new projects. Long-term emissions reduction target of net zero by 2050, interim target of 15 to 20% reduction from 2005 levels by 2020. Victorian renewable energy targets (VRET) of 25% renewable energy by 2020 and 40% by 2025 in June 2016. The VRET will rely on a reverse auction to encourage the construction of new wind and solar projects in Victoria. A Victorian Climate Change Strategy is required every five years. Adaptation Action Plans are to be prepared by nominated Ministers and Victoria’s Climate Change Adaptation Plan 2017-2020, outlining strategic priorities, measures and responses for adaptation in Vic under the Climate Change Act. A pledge model for business, communities and individuals has been adopted: Victoria’s TAKE2 Program, joined the Under2 MOU. Victoria’s Climate Change Framework – vision for Victoria in 2050 includes: A Renewable Energy Roadmap with 25% by 2020 40% renewable energy by 2025; and a $20 million New Energy Jobs Fund. Investing in and enhancing public transport – purchasing renewable energy for trams, developing an integrated system, supporting walking and cycling (Cycling Strategy), supporting innovation EVs. Western Australia is committed to mitigating the effects of climate change, overseeing state operations through the WA Office of Climate Change, which sits within the WA Department of Water and Environmental Regulation. To date, no specific state-based emissions-reduction target has been set; WA will reduce emissions in line with national targets and rely on national mitigation policy. Increased water security through improved infrastructure, pricing, efficiency and recycling. Increasing resilience across state agriculture, forestry and fisheries industries and in major infrastructure. Support for the transition from coal to gas-based energy grids and energy efficiency. Implementation of a Low Emission Energy Development Fund (LEED), supporting innovative technology. The Australian Government’s international response coalesces around its 2030 target of reducing emissions by 26-28% below 2005 levels by 2030, which forms the foundation of its Nationally Determined Contribution under the Paris Agreement (Australia’s national 2030 emissions reduction target). Further to this target the Government, predominantly through the Department of Foreign Affairs & Trade, engages in resilience and development activities to support the climate mitigation and adaptation of allies in the Asia Pacific region – particularly low lying Pacific Island nations. This includes support through direct aid, capacity building and facilitating through bilateral relationships the trade of low-carbon products and services into the region. Further afield, Australia is aligning these aid, trade and diplomatic relationships to effectively support the transition to a global zero-carbon economy, and Australia’s role in the transformation underway. The UNFCCC is an international environmental treaty adopted on 9 May 1992 that entered into force on 21 March 1994. Today, it has near-universal membership. The 197 countries that have ratified the Convention are called Parties to the Convention. The UNFCCC is a “Rio Convention”, one of three adopted at the “Rio Earth Summit” in 1992 and preventing “dangerous” human interference with the climate system is the ultimate aim of the UNFCCC. The parties to the convention have met annually from 1995 in Conferences of the Parties (COP) to assess progress in dealing with climate change. Parties are required to develop, publish and make available to the Conference of Parties (COP), national inventories of emissions by sources and removals by sinks. Parties also commit to developing national plans that contain measures to mitigate climate change, promote and cooperate in the development and transfer of technologies and scientific researched aimed at controlling, reducing or preventing human-induced emissions of GHGs. In recognition by the international community that more urgent action, with more powerful and legally binding measures than what was required under the UNFCCC, was needed, ancillary negotiations led to a subsidiary agreement under the UNFCCC, known as the Kyoto Protocol. This came into force in 2005 and committed developed countries to greenhouse gas emissions reduction targets. A second commitment period under the Kyoto Protocol was accepted under the Doha Amendment. The Paris Agreement is the new global agreement on climate change, adopted by Parties under the UNFCCC on 12 December 2015 and committing all countries to take action on climate change to take effect from 2020. “UNFCCC” is also the name of the United Nations Secretariat charged with supporting the operation of the Convention. The Secretariat, augmented through the parallel efforts of the Intergovernmental Panel on Climate Change (IPCC), aims to gain consensus through meetings and the discussion of various strategies. The Paris Agreement, reached in December 2015, aims to limit the global temperature increase to 1.5 – 2 degrees Celsius. It is based on voluntary emission reduction commitments made by each country – in the form of Nationally Determined Contributions (NDCs) – and requires countries to revise NDCs at least every five years through a global stocktake process, starting from 2023. While the emission reduction targets themselves are not legally binding, the process of regular review and submission of NDCs is binding. Australia’s NDC target is to reduce emissions by 26-28 per cent below 2005 levels by 2030. This will see emissions per capita halved and the emissions intensity of the economy fall by around 65%. Paragraph 6.1: Recognises that Parties may cooperate voluntarily in the implementation of their NDCs and this may allow higher ambition and the promotion of sustainable development and environmental integrity. Paragraphs 6.2 to 6.3: Specifies that Parties may use internationally transferred mitigation outcomes (ITMOs) in meeting their NDCs, thus making it possible for emission reductions measures to be implemented in one country and the resulting emission reductions to be transferred to another and counted towards its NDC. The paragraphs also state that the use of ITMOs will be take place under robust governance and accurate accounting to avoid double-accounting. Paragraph 6.4: Outlines a new mechanism to ‘contribute to the mitigation of greenhouse gas emissions and support sustainable development’. This new mechanism has become unofficially known in many networks as the Sustainable Development Mechanism (SDM). This paragraph also states that the mechanism will be supervised by a body designated by the Conference of the Parties, that will aim to (among other aims) incentivise and facilitate participation by public and private entities. Paragraphs 6.5 to 6.7: Focuses on avoiding double-counting of emissions reductions in meeting NDCs and the use of proceeds for administration and in the support of developing nations. Paragraphs 6.8 to 6.9: The final section of Article 6 refers to non-market mechanisms for Parties to meet their NDCs through mitigation, adaptation, finance, technology transfer and capacity-building activities as appropriate. At COP22 in 2016 in Marrakech, Australia and the UK launched an initiative to deliver a US$100 billion Climate Finance Roadmap, based on the goal agreed on by all countries at the UNFCCC COP in 2010 and reinforced at COP21 in 2015. This Roadmap outlines key factors and pathways to achieve the committed US$100 billion climate finance with Australia pledging AU$1 billion over 5 years. Based on an analysis of the Roadmap, the OECD report ‘2020 Projections of Climate Finance Towards the USD 100 Billion Goal’ shows that developed countries will likely meet the stated goal through mobilising public and private finance. In the final days of COP21 in Paris leading up to the announcement of the Paris Agreement, a New Zealand-led declaration by Ministers representing 19 countries was signed, reiterating the importance of carbon markets and their role in ensuring the success of the Paris Agreement (particularly Article 6). Acknowledging the role of carbon markets post 2020 in the global effort to reduce emissions, the Ministerial Declaration ensures collaboration on the development of standards and guidelines for using market mechanisms and particularly the avoidance of double-counting or claiming of emissions reduction units. It was signed by Australia’s Foreign Affairs Minister Hon. Julie Bishop in Paris, who recognised that carbon markets could provide flexibility for companies and countries in meeting their commitments. The Kyoto Protocol is an international treaty, negotiated and concluded at the third UNFCCC Conference of Parties (COP) in December 1997 in Kyoto, Japan, following submissions and talks at COP1 (1995) in Germany. The Kyoto Protocol sets legally binding obligations for developed (as distinguished from developing) countries to reduce their greenhouse gas emissions. It entered into force generally on 16 February 2005. As a global policy mechanism, the Protocol serves to give effect to the UNFCCC’s objective of reducing human-induced greenhouse gases as a way to ”prevent dangerous anthropogenic interference with the climate system”. The first commitment period started in 2008 and ended in 2012. Australia signed the Kyoto Protocol on 24 April 1998, although only ratifying nearly a decade later in December 2007. Under the Protocol, Australia was required to limit its average annual greenhouse gas emissions growth over the 2008–2012 period 8 per cent above 1990 levels. This agreement by Australia works in tandem with Australia’s ratified and legislated Nationally Determined Contribution (NDC) pledge to the UNFCC under the Paris Agreement, of reducing emissions to 26-28 per cent below 2005 levels by 2030. To date, 192 parties have ratified the Kyoto Protocol. The second commitment period, established in the Doha Amendment, was agreed on in 2012 extending the Protocol to 2020; the efficacy of this second period has been criticised as Canada withdrew from the agreement in 2011, and the United States never officially ratified it. The Kyoto Protocol was not extended again post-2020; a different global arrangement in the form of the Paris Agreement was created to cover emissions of both developed and developing countries, and allow more flexibility for signatories to manage their emissions reduction challenges than was possible under Kyoto. To date, five auctions have been held with the 6th scheduled for December 2017. The Regulator has spent $2.23 billion across these first five auctions, which has resulted in 435 contracted projects representing 189 million tonnes of abatement at a weighted average price of AUD$11.83 per tonne of abatement.